Registration with the Apple Developer Program is required to develop iOS applications. Refer to the Apple Developer’s Website (http://developer.apple.com/devcenter/ios) for detail. 5) Enter “Supported external accessory protocols”. 6) Enter “com.bixolon.protocol” in the Items field. 1) Select Project, Info, and + in the order shown below. 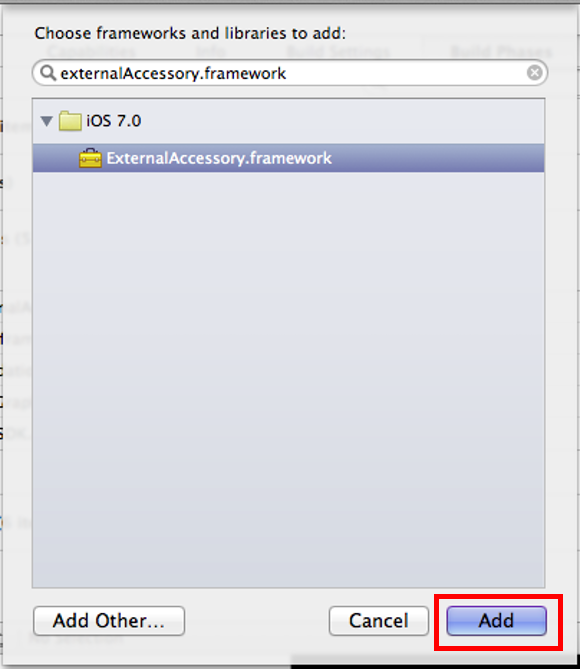 2) Search “ExternalAccessory.framework” and click the [Add] to add it. Drag the library folder and drop it to the project. MPosControllerDevices class is an object that provides the most basic functions related to the target control device. This method configures the interface connected to mPOS Thermal Printer. Refer to [6-4-3-11 Appendix - 1 Defines - 1) __MPOS_RESULTS_] for other cases. This method may fail if any of the devices in the list that are connected to mPOS are open when checked with the isOpen method. Interface must be selected with this method before calling OpenService method of any device class. mPOS that are assigned to the current class returns the deviceID of the device. This method may fail if any of the devices in the list that are connected to mPOS is open when checked with the isOpen method. This method initializes communication if a device corresponding to this class is connected to the mPOS Thermal Printer. This method initializes communication if there is a device with the given DeviceID in the list of devices connected to the mPOS Thermal Printer. Failure code will be returned if the given DeviceID is not associated with this class or if it is not connected. This method terminates the use of the corresponding device. This method checks whether a device is connected using this class. // If device is closed. This method sends or reads user-defined data. It contains the ANSI CODE data to send to printer. Assigns a device which is recognized as HID Input device to a certain device by force, and then make it work. If any of the devices connected to mPOS is identified as Open through isOpen Method, it may not operate. // ……. Do other process you want. • Selects a device which is connected with mPOS or a device which is directly connected with iDevice for data communications. MPosControllerPrinter class is an object that provides various functions of the printer among the devices connected to the mPOS Thermal Printer. This is for the registration of Notification about the data that can be obtained from the device corresponding to this class. To read the corresponding data if there is a Printer Model Name in the notified data. It occurs when calling. It is for reading the corresponding data if there is a Printer Fw Version in the notified data. This method initializes communication if a device corresponding to this class is connected to the mPOS Thermal Printer Thermal Printer. This method closes the device corresponding to this class. It does nothing if there is no printer connected to the mPOS Thermal Printer. This method prints image file. Width of image file to convert and print, with the range of 0 ~ maximum width. If the value is smaller than 0, image will be converted with the following conditions. Image color level and diffusion option. This method prints 1D and 2D barcode. ANSI code data with null terminator. It has no effect in 2D barcode. If barcode print area exceeds the size of paper, printing may stop or only part of the barcode is printed. This setting has no effect to 2D barcode. This method checks the printer status. This method checks the printer status automatically. This method enables the printer status data. MPosControllerMSR Class is an object that provides various functions of the MSR among the devices connected to the mPOS Thermal Printer. This is for the registration of Notification for the data that can be obtained from the device corresponding to this class. It is for reading the corresponding data if there is MSR Track Data in the notified data. MPosControllerScanner Class is an object that provides various functions about Scanner among the devices connected to the mPOS Thermal Printer. It is for reading the corresponding data if there is a Barcode in the notified Scanner Data. It is for reading Barcode Type if there is a Barcode in the notified Scanner Data. MPosControllerBCD Class is an object that provides the functions of the BCD among the devices connected to the mPOS Thermal Printer. This method is for displaying the given string on the upper side of the screen of BCD device. This method is for displaying the given string on the lower side of the screen of BCD device. This method removes all the contents from the screen of BCD device. This method displays strings on the BCD device. This method stores images on the BCD device. This method displays images on the BCD device screen. This method clears images stored on the BCD device. If isAll is NO, the images stored on imageNumber are cleared. MPosControllerTTYUSB Class is an object that provides various functions of the undefined USB device among the devices connected to the mPOS Thermal Printer. It is for reading the corresponding data if the notified data includes the data generated from TTYUSB device. BGATELookup Class is an object that searches mPOS Thermal Printers available for connection. This method is to initialize the BGATELookup object. This method searches mPOS Thermal Printers on the Wi-Fi network. This method searches mPOS Thermal Printers connected via Ethernet. This method searches mPOS Thermal Printers paired to the iDevice. This method returns a list of mPOS Thermal Printers searched using refreshWifiDevicesList API. The list of devices is stored as an NSArray. This method returns a list of mPOS Thermal Printers searched using refresh Ethernet DevicesList API. This method returns a list of mPOS Thermal Printers searched using refreshBluetoothDevicesLis API. MPosControllerConfig Class is an object that provides mPOS settings. It is for reading the corresponding data if there is CustomDevice Data in the notified data. To read the corresponding data if there is USBID Data in the notified data. To read the corresponding data if there is Find Dev Data in the notified data. To read the corresponding data if there is add Device info in the notified data. To read the corresponding data if there is delete Device info in the notified data. To read the corresponding data if there is reinit info in the notified data. This method gets Custom Device List in NSArray data type. Set the array to save Custom Device list. This method registers Custom Device. Set the Device Info(pID1, pID2, vID1, vID2). Set the Custom Device Type. This method deletes Custom Device. This method reinitializes the Custom Device. This method gets Usb ID List in NSArray data type. This method gets findDevID in NSArray data type. This method gets Serial Configuration. Set the object to save serialConfiguration. This method sets Serial Configuration. MPosControllerLabelPrinter Class is an object that provides the Label Printer. Select the current string encoding type. This method prints in the printer buffer. long lResult = [_printer printBuffer:1]; // Any number bigger than 1 will repeat the same printing for the specified number of times. This method draws strings on the image buffer using Device Font. Horizontal magnification of the selected font (1~4). Vertical magnification of the selected font (1~4). Right side margin of the characters (ex: 5, +3, -10…). Option to use the Reverse Font. Reverse Font will be used for printing if this parameter is set to YES. Option to use the Bold Font. Bold Font will be used for printing if this parameter is set to YES. Nothing will be printed when this API is called. Contents requested by this API will be printed when 6-4-3-10 MPosControllerLabelPrinter Reference - 2 Instance Methods - 3) printBuffer API is called. lResult = [_printer drawTextDeviceFont:@"device Font Test"
Option to use the Italic Font. Italic Font will be used for printing if this parameter is set to YES. lResult = [_printer drawTextVectorFont:@"draw Font Test - Vector"
This method requests the printing of 1D barcode to the image buffer. This method requests the printing of MaxiCode barcode to the image buffer. lResult = [_printer drawBarcodeMexiCode:@"Maxi Code Test!!!" This method requests the printing of PDF417 barcode to the image buffer. This method requests the printing of QRCode to the image buffer. lResult =[_printer drawBarcodeQRCode:@"QR Code Test"
This method requests the printing of Data Matrix to the image buffer. This method requests the printing of Aztec to the image buffer. lResult = [_printer drawBarcodeAztec:@"Aztec Barcode Test"
This method requests the printing of Code49 to the image buffer. lResult = [_printer drawBarcodeCode49:@"Code 49 Test"
This method requests the printing of CodaBlock to the image buffer. This method requests the printing of Micro PDF417 to the image buffer. lResult = [_printer drawBarcodeMicroPDF:@"MICRO PDF 417 TEST"
This method requests the printing of BarcodeIMB to the image buffer. This method requests the printing of BarcodeMSI to the image buffer. This method requests the printing of BarcodePlessey to the image buffer. This method requests the printing of BarcodeTLC39 to the image buffer. This method requests the printing of BarcodeRSS to the image buffer. lResult = [_printer drawBarcodeRSS:@"12345678901|this is composite info"
This method requests the printing of BarcodeGS1DataBar to the image buffer. This method requests the printing of Block to the image buffer. This method requests the printing of Circle to the image buffer. This method requests the printing of Image to the image buffer. Set the offsetValue (-100 ~ 100). This method gets information and Model Name. The method gets information and Firmware Version. The following table contains the definitions of result codes returned by various methods. Failed to open the device. Device is busy in processing other tasks. * The following options are available for this value. It sets the position to print barcode data. * The following options are available. Barcode data is not printed. Barcode data is printed above the barcode. Barcode data is printed below the barcode. This attribute defines the barcode type. This is an attribute to set the size of text, and the height and width can be set simultaneously using bitwise OR combination. Width magnification factor is set to X1.